The embattled mayor of Tower Hamlets has said he does not believe an investigation into his council will find any serious wrongdoings. The government is investigating claims that Lutfur Rahman had disproportionately funded Bengali groups in order to get their vote. 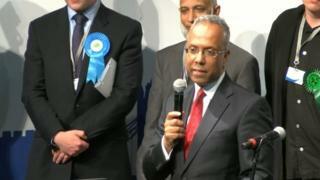 Speaking to BBC London 94.9, the re-elected mayor said: "I have done, and we have done, nothing wrong." The report is due to be published by the end of June. The investigation into the east London authority was launched following the broadcast of a BBC One Panorama programme that claimed Mr Rahman had more than doubled funding recommended by officers for Bengali-run charities. Separately, the Metropolitan Police is investigating 84 complaints into the election which was held on 22 May. It said in the majority of cases, no criminal offences had been committed. Two people have been arrested - a 24-year-old on suspicion of conspiracy to defraud in relation to postal vote applications on 3 June, and a 38-year-old man in connection with an allegation of potentially false declarations on nomination forms on 13 May. The Electoral Commission has also launched a review into the count. Mr Rahman exclusively told presenter Eddie Nestor: "I don't believe they will find any serious irregularity in any of our governance, our financial structures or the way we run the council. "If there is any issue here, of course we will look at it and try to learn from it and try to improve on it, but don't forget, if he was looking for fraud, he will find no fraud. "The police have already said there's no evidence of criminality in Tower Hamlets; this is about governance issues, this is about value for money and who we are." He added: "Twice I've had a mandate to serve the people of this borough. On that basis, give me a chance; look at my policies, look at what I've delivered and look at my philosophy and vision. Judge me on that."